Basically the title suggests that you create some kind of a scene involving at least one of our CI products in the make. 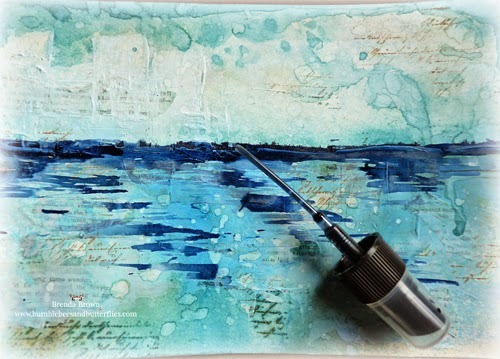 The scene might be made using just one of our collage stamps, or might incorporate several of the items from an Elements plate, or might use several of our different stamps combined together - to tell a bit of a story. I think it is a really good subject to choose, and gives lots of scope for experiment. A picture was starting to emerge in my head with thoughts buzzing around in there too. It looked pretty similar to what I ended up with which is quite unusual for me. 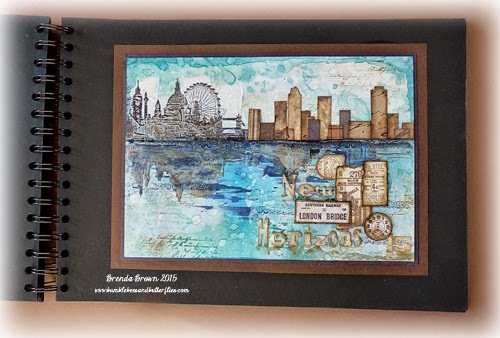 I started with the idea of having a horizon line to create a cityscape scene of rooftops and making a collage with stamping and cut outs. 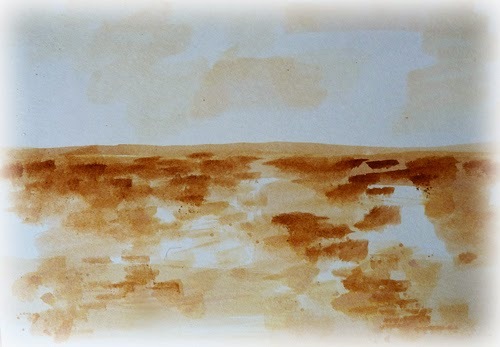 I painted the first layer with vintage photo distress ink as I imagined this mixing with a layer of gesso over the top. When I look back to this I realise that actually none of this is seen in the final piece. 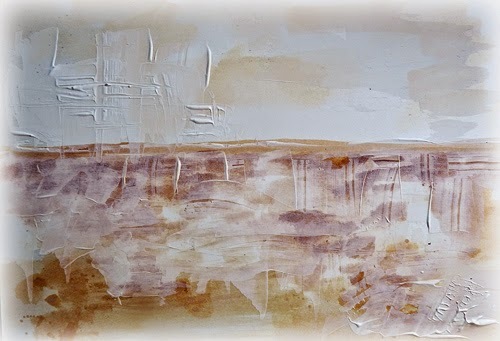 But this all started to create the scene adding gesso as texture, a resist and adding lines above the horizon where I will stamp 359. 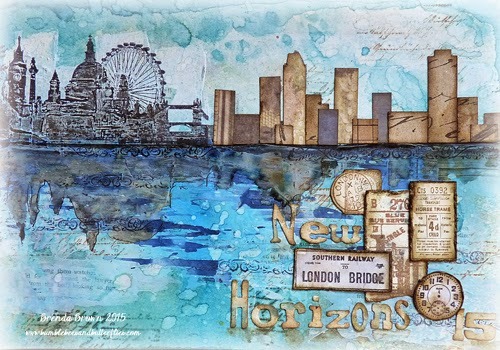 I chose this stamp a) for the silhouette skyline shape and b) because I want to get to go into London more this year. I love the city but get up so rarely, so here's hoping. I also added some stamped text (214) using coffee archival so that it would not merge with any further distress products. 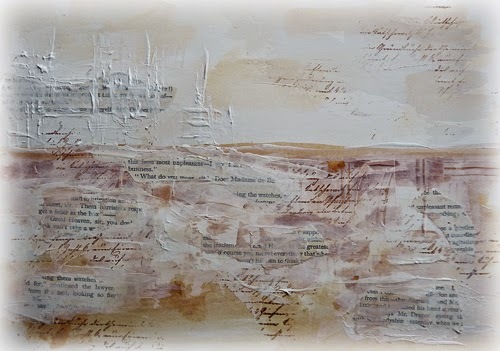 In my own crazy head I began to see the lower portion as the River Thames as I added some torn old book paper with gesso and vintage photo DI. Ok what to do next? So I decided that if there’s sky and water then there needs to be some blues. First I sprayed water and then broken china, salty ocean and weathered wood over the whole piece keeping the weathered wood to the sky area and the darker colours to the water area. I dipped the sky are in some broken china and dried it and then splattered water over all of it and dried again. 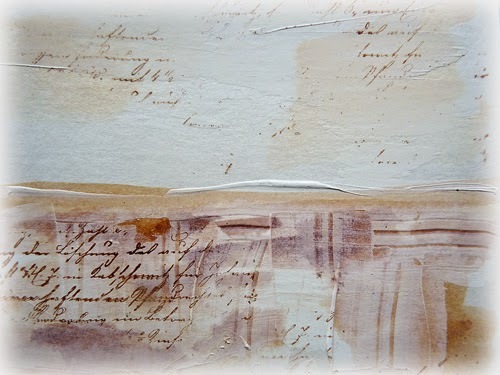 This next bit I love, I used faded jeans distress stain and undid the spray piece using the tube to paint on the ink, cool eh? It's really beginning to look like a waterscape. 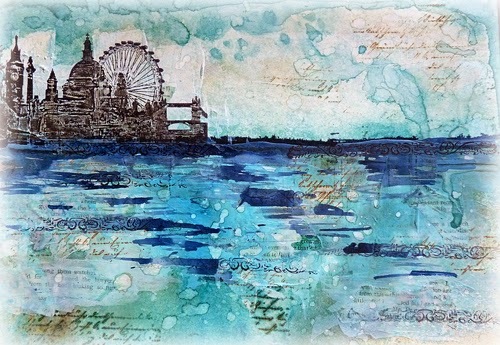 I found a thin ornate strip die which I stamped across some of the deep blue areas and then I stamped the Christmas city skyline without the Christmas tree. As this was stamped onto a textured area it didn’t take all the ink as a silhouette normally would but I love the impression it gave giving the buildings some depth to them. BY shading the non inked areas with a 4B pencil it gave some shadow effects too. 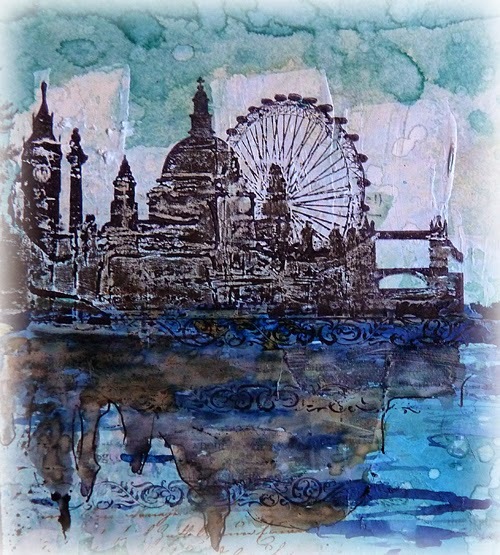 So now I needed a reflection and I tried reverse stamping with both archival and distress inks, but neither worked, so I stamped the image onto card, cut it out and then laid it upside down in the water drawing a rough outline. 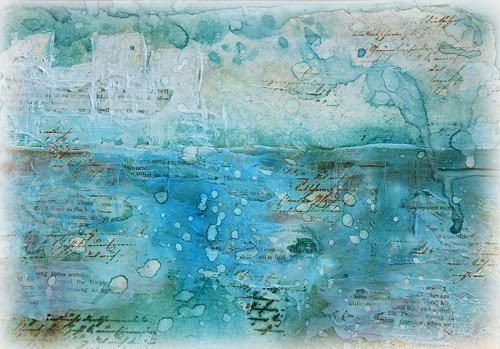 A watery wash of pumice stone, black soot and vintage photo inks filled in the watery effects. I still wanted more so I drew some in building shapes, painted them and their reflections with the idea I would add a title and some collage pieces to it. I already knew what I wanted to call it. (Photo taken at night which is why it went somewhat blue). I wasn'thappy with the painted building shapes so out came the collage scraps and built a line of new ones, I rather liked these much better and I added more reflections in the water. The final collage was added using ticket ephemera from 307, 239 and 255 and the title using alphabetical strip die. .... and mounted in my collage journal. You will find all the challenge guidelines on the CI blog and you have until the end of January to join in. You could be in with a chance of winning a free stamp, and you be able to obtain a cool 25% CI web discount if you enter. That's it for today, thanks for stopping by and for giving me your support. I read every comment and am so grateful to receive them. I think the choice to collage the buildings instead of the painted versions was a really smart move. The lighter colours of the papers added so much more interest. It looks amazing. Das ist ein fantastisches Panorama auf deiner Karte. Es sieht so real aus, und auch wie ein kostbares Gemälde. Einfach wunderschön, wie sich alles im Wasser spiegelt. Wieder mal ein neues Meisterwerk von dir. A wonderful cityscape. I really like the contrast between the London stamp and the blocks of skyscrapers. What a gorgeous skyline scene Brenda! love the sky and water and your great reflected images! Wow, Brenda, this is amazing. Wow Brenda, what a work of art this should be framed and up on your wall. An awesome city scape, the reflections and textures look fantastic. 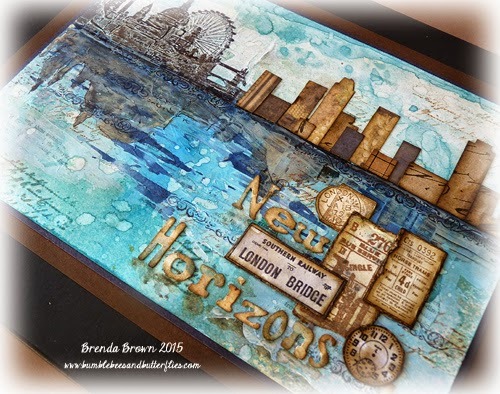 That really is a different type of piece from you, Brenda--but it's absolutely beautiful, as always!! Perfect work Brenda, I love your scene!!!! 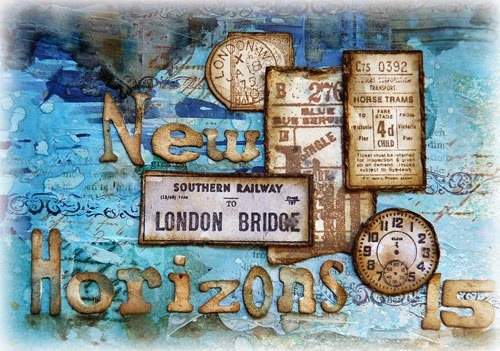 Gorgeous collage.....I love your composition colors and balance, and the reflections are brilliant! WOW! 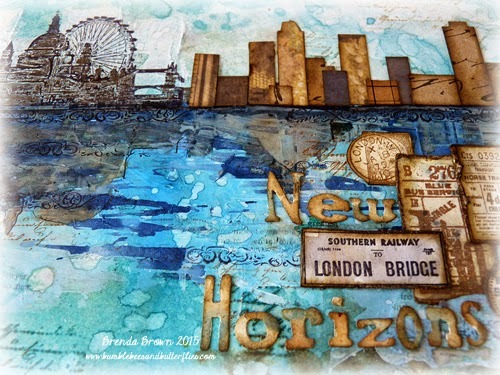 Brenda, this mixed media cityscape in out of this world gorgeous! I love all the texture and the way you built up each layer! Love this much! Hope your weekend is wonderful. Hugs! It's wonderful! i love the blending colours and thanks for showing the process! Fabulous Cityscape. Love the way you have done the reflections on the water. Love the embellishments. This is just absolutely TERRIFIC Brenda !!!! 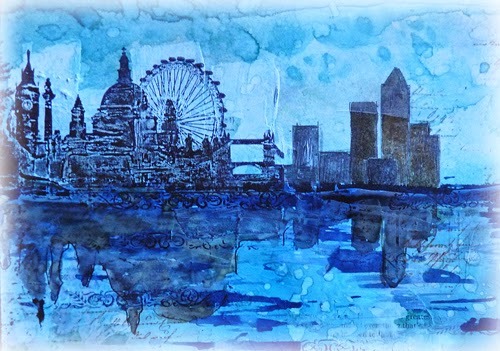 I really the two parts of your amazing cityscape in London, love how you drawed and filled the reflection and everything below ground feel. Well, all is fabulous. This looks like you had a lot of fun playing, makes me so joyous to see that.. art should be always fun. wow this looks stunnung, love the skyline and the beautiful colors! 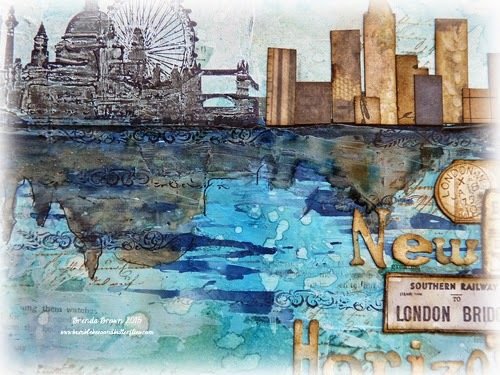 Wonderful watery layers creating such depth, and I love how you created the reflection of your stamped London skyline, as well as those fabulous collaged skyscrapers - brilliant!